The Republican candidates running for US President met at the Ronald Reagan Library in Simi Valley. 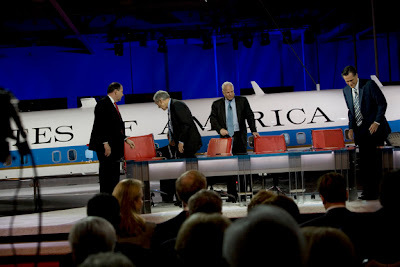 Candidate McCain and Candidate Romney slugged it out while completely ignoring Ron Paul and Mike Huckabee. Spotted in the crowd, Nancy Reagan, Gov. Arnold Schwarzenegger, Fred Hayman, and Lee Iaccoca.